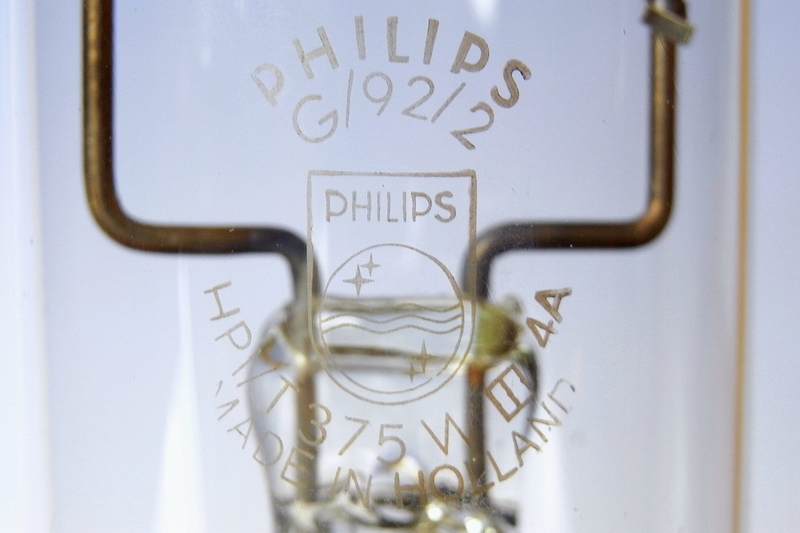 This 2nd generation lamp represents a major improvement beyond Philips' first HPI lamps. 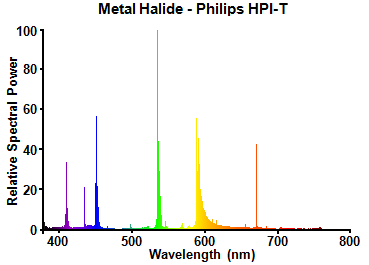 The original conical-ended arc tubes suffered from small dimensional variations, which influenced halide vapour pressures and hence light colour. Here the shape has been optimised for horizontal-only burning, and takes the form of a flat-ended cylinder. The electrodes are recessed in end pockets that are coated with heat-reflective zirconia paint to keep that area hot. The result is an intentional and consistent cold spot at the sharp corners of the body, where the halides condense and result in tighter colour uniformity between lamps. 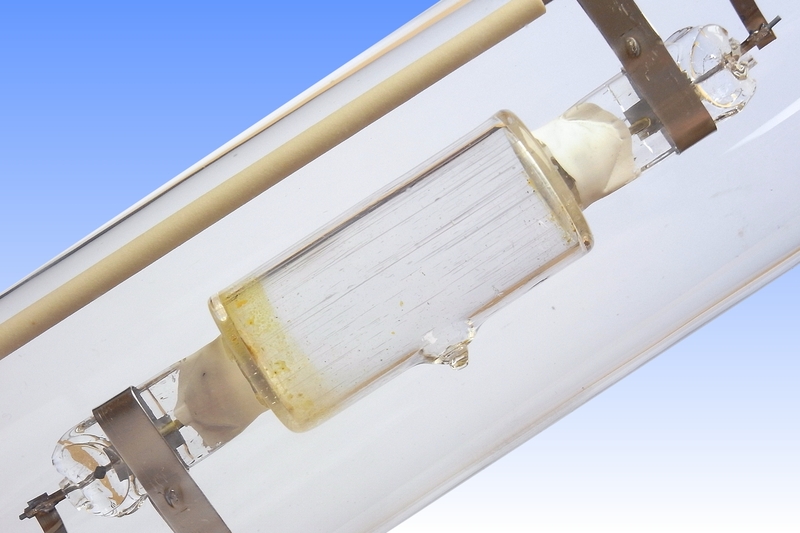 A steatite tube over the frame beside the arc tube minimises photoelectric effects, to limit sodium loss and colour shift over life. 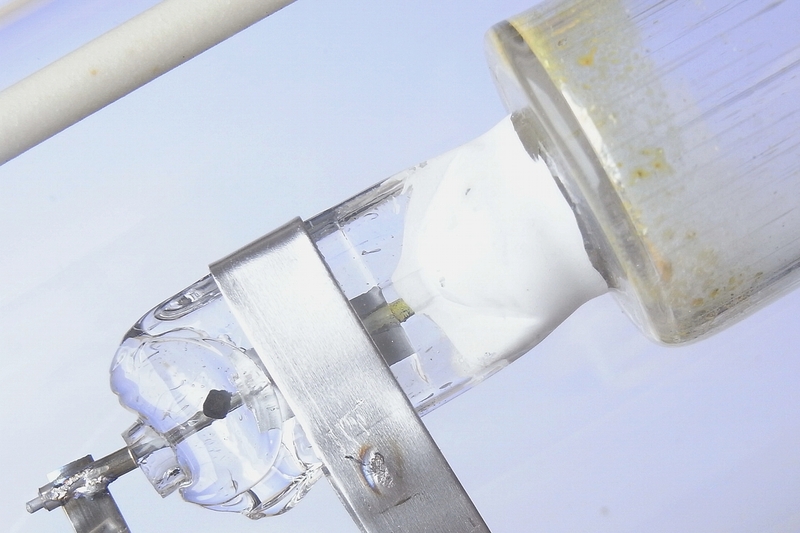 The arc tube fill has been changed to a Neon-Argon Penning mixture to reduce the igntion potential to about 700V. Since Neon is able to diffuse through quartz and would be lost if the outer jacket was under vacuum, it is filled with a Neon-Nitrogen mixture having the same partial pressure of Neon as the arc tube so that Ne diffuses back in as quickly as it is lost. 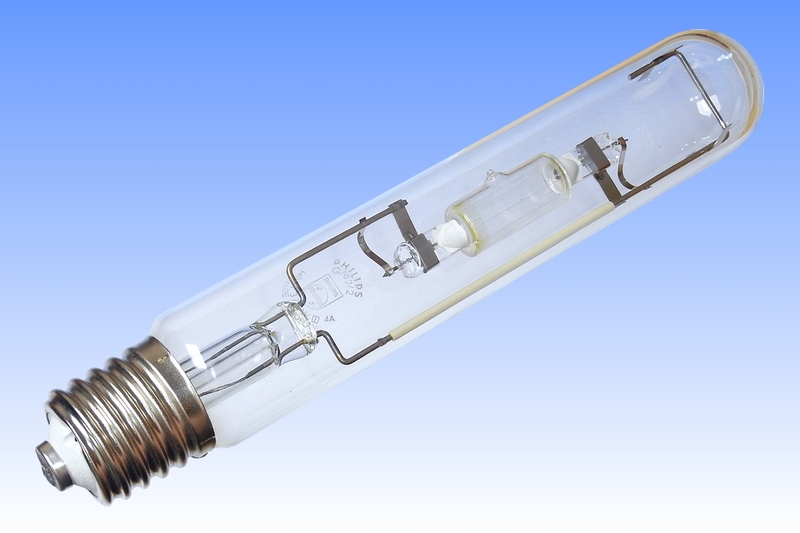 Owing to the high thermal conductivity of neon, the arc tube is unusually small to attain high enough temperatures. The arc tube seal reveals a curious residue of the exhaust process, in which small tubes of quartz were melted over the end to protect the seal during furnacing of the arc tube for 40h at 1030°C to bake out impurities - after which they were opened, re-filled with clean gas and finally tipped off. The unusual rating of 375W refers to the actual lamp wattage - this was later re-rated to 400W, to indicate on which ballast the lamp should be operated. Luminous Flux: 30,000 lm (@ 100hrs) approx. Luminous Efficacy: 80 lm/W (@ 100hrs) approx. 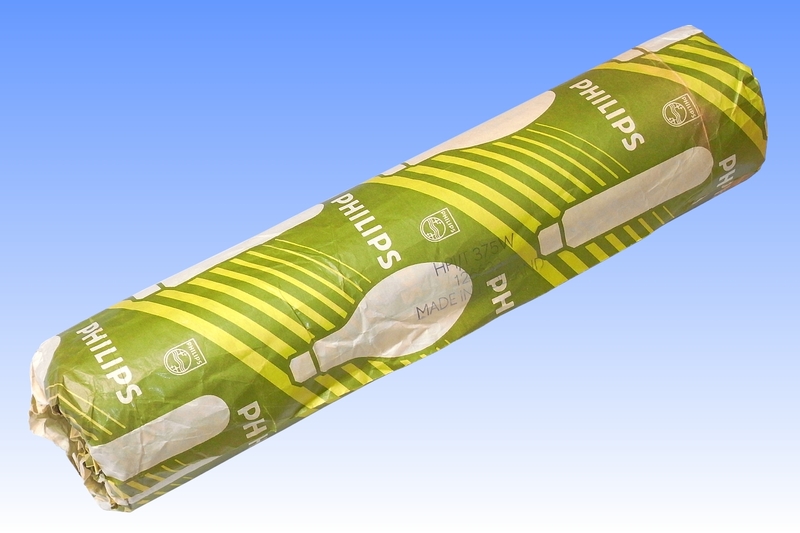 2) Philips Training Manual MTO Turnhoutlampen - Metaalhalogenidelampen, F. Oostvogels, D. v.Pijkeren & G. Rouweler, 1985.